Beer fermentation starts in the primary fermenter. The purpose of primary fermentation is to capture the active phase of strongest fermentation, which usually lasts about 3 days. Many traditional references recommend moving your beer to a secondary after active fermentation has subsided – which is a separate fermenting vessel. Transferring your beer to a secondary separates the beer from the trub, which at this point has both yeast sediment, hops sediment and grain/tannin pieces left over from the mash. By separating the beer from this sediment, you reduce contact with bitter tannins, bitter hop debris and inactive and dead yeast cells. Many people believe this will allow the beer to clear more quickly and reduce off flavors in the finished beer. Brewers planning to leave their beer in a fermenter for a longer period also use a tertiary fermentation – where the beer is separated from the sediment again after the bulk of flocculation (yeast falling out) has occurred. Often this takes place several weeks after brewing, and it leaves much less sediment to support long term storage of the beer in a fermenter (often a carboy) before bottling or kegging. Why Bother with the Secondary? The theory behind moving beer to a secondary or tertiary is that it is beneficial to separate the beer and sediment as soon as possible after active fermentation. The dead yeast cells, hop matter and grain matter left over from brewing and active fermentation could impart off flavors if left in contact with the beer for too long. The fact that many home brewers use buckets or carboys for fermentation means that a fairly large surface of sediment is in contact with the beer. Also moving to a secondary gives the brewer a great opportunity to harvest yeast for washing and reuse. What do the Pro Brewers Do? Almost all craft and pro breweries now use conical fermenters as a “unitank” or single fermenter. They don’t transfer to a secondary or tertiary fermenter. Instead the conical fermenter has a conical bottom that collects the yeast at the bottom of the cone – making it easy to remove sediment from the bottom. Also the conical design means that only a small amount of beer is in contact with the sediment plug at the bottom of the fermenter. Because of the conical design, they don’t have to transfer the beer to another tank to separate it from the sediment. They simply open the valve at the bottom and drain the sediment out leaving the beer behind. They can harvest yeast this same way. So craft breweries don’t need to use a secondary or tertiary even if storing for a long time – they just periodically drain the sediment and leave it in the same conical fermenter. The main problem with using a secondary fermentation in home brewing is that you take a risk every time you transfer the beer. The first, and largest risk is oxidation. 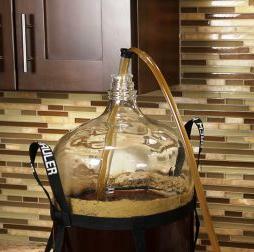 Siphoning your beer involves splashing and exposing your beer to oxygen. Even a very small amount of oxygen can spoil the long term stability of your beer. The second risk is contamination. Even if you use good sanitation practices you always run the risk of possible contamination. Finally, many brewers believe that if you use modern brewing ingredients and techniques with robust active yeast, the sediment is not much of a problem. A proper mash pH and long boil will reduce the chance of excessive tannins or sediment problems. Healthy yeast and a good yeast starter will not hurt the beer even if left in contact with the beer for several weeks. We just won’t leave out beer on the sediment for months before bottling. So what’s the bottom line? While a secondary can be useful, you need to weigh the risks versus benefits. I would say that the average home brewer runs a bigger risk from oxidation doing a secondary than they do from off flavors introduced by sediment. So if you are using good quality ingredients and techniques, a pure yeast strain with a good starter, and are not planning on leaving the beer in your fermenter any longer than needed – then a secondary is not needed. Just leave it in the primary and let it go. On the other hand if you are planning to leave beer in the fermenter for a long period, it might be good to use a secondary. Just be very careful to avoid splashing and oxidation. Finally, if you want to avoid the problem entirely just move to a conical fermenter. There are a number of affordable conical fermenter options available now for home brewers – and a conical lets you remove the sediment without risking contamination or oxidation. Have some thoughts on the secondary or fermenters in general? Leave a comment below. Thanks for joining me on theBeerSmith Home Brewing Blog. Be sure to sign up for my newsletter or my podcast (also on itunes…and youtube…and streaming radio station) for more great tips on homebrewing. Also check out the How to Brew Video series I shot with John Palmer if you want to learn more about all grain brewing. Obi110 reuse using raspbx – How? Hellbach blog Proudly powered by WordPress. Designed by Köp Online.